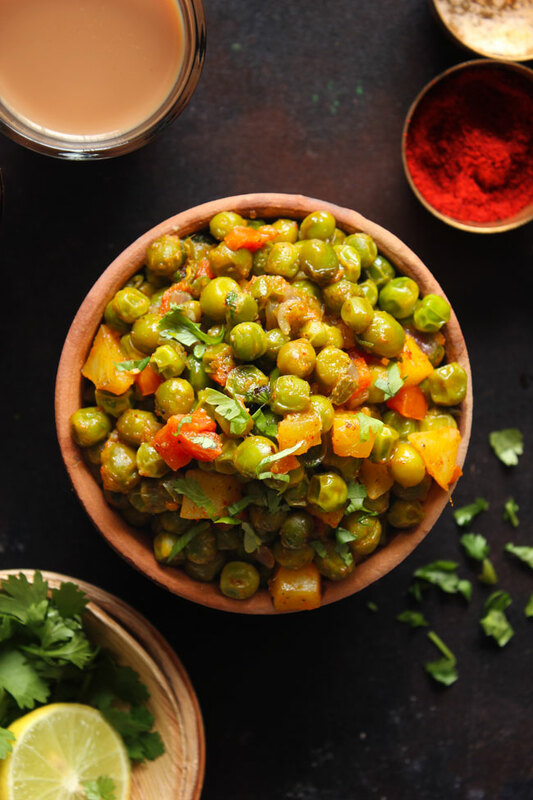 Matar Ki Ghugni is a delicious Indian style green peas one pot breakfast. 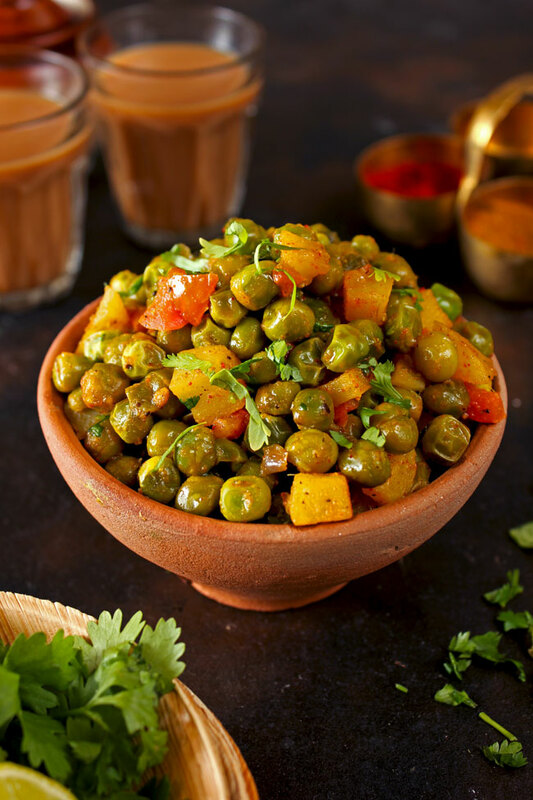 A vegetarian snack made with fresh green peas and served as a mélange of warm flavors in the midst of cold winters. Winter peas are the star of this protein loaded Indian breakfast recipe. It is a one-pot wonder that happens to be gluten-free and vegan. 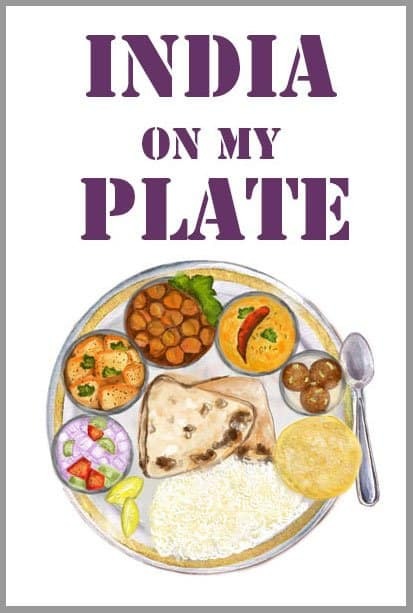 Most nutritionists have asserted how essential it is to eat local and to eat what’s in season. This is nature’s way of keeping one healthy and well fed. It also explains why certain produce grows in specific geographical locations – it is to nourish and meet the needs of the natives during a particular season. For Central India, winters can be harsh and turning to meat (which is undeniably an ingredient that generates a lot of body heat) isn’t always an option every day, and it isn’t an option if you’re vegetarian. Green leafy vegetables (saag) and peas are a great food to consume during this time not just for the high nutritional value but also because they are excellent sources of protein. Why Are Green Peas Healthy? Green Peas or matar are good news for everyone because they taste so good and are highly nutritious. Research also shows that peas fight cancer because they are so high on antioxidants Now that we’ve seen the exhaustive benefits of green peas, it’s time to add them to your diet if you haven’t already. Peas are high in Omega- 3 fatty acids. Green peas are very low in fat and are a good source of Vitamin E.
Ghugni is traditionally made with white peas and spices, simmered over heat till it reaches the right consistency. 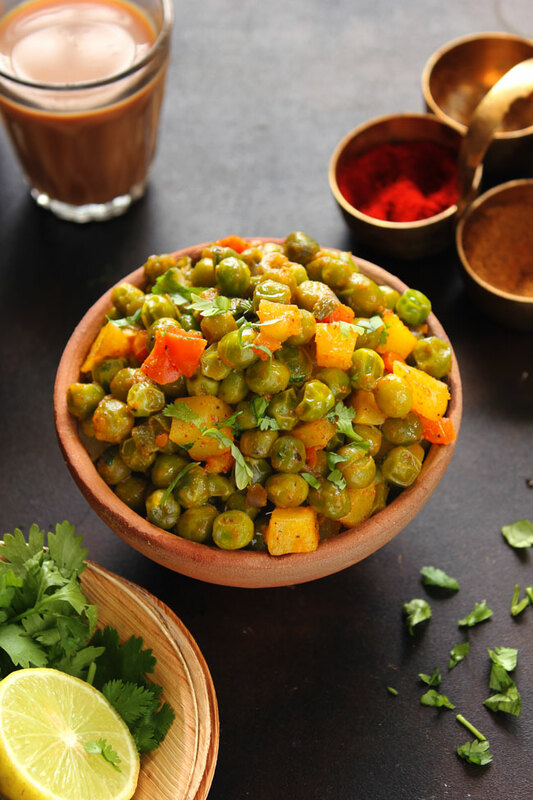 But in many regions of India, ghugni is prepared with fresh green peas especially during the winter season. A bowl of matar ghugni is a protein powerhouse goodness to nourish one’s body. Matar Ki Ghugni can be served by itself for breakfast or a snack, or as a lunch with some paratha alongside. If you’re feeling particularly peckish, you can eat this with a half fry egg on top – a wholesome breakfast at its best. How To Make Matar Ghugni? There are different ways to make a ghugni. You can make it like a quick one-pot meal in your pan. Or you can pressure cook (also read: 10 best pressure cooker recipes) it to a smoother, richer consistency to be eaten with some onions, grated radish and maybe even a green chutney or yogurt if you like it that way. There are many variations to be tried with this one. My recipe is a quick flash-in-the-pan sort of ghugni recipe that’s just perfect for breakfast. We are using mustard oil for the extra kick in the flavor. Mustard oil lends a nutty flavor that adds to the character of the dish — just a handful of basic ingredients, peas, and potatoes. Can We Use Frozen Peas To Make Matar Ki Ghugni? Yes, frozen green peas can be used to make green peas ghugni. But keep in mind the taste of the dish might differ a little bit. The fresh peas have a certain crunch and flavor to them. Though with frozen peas the cooking time of ghugni is reduced to half. If cooked for a longer duration, frozen peas might turn mushy. 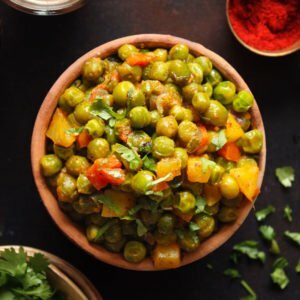 Matar Ki Ghugni is a delicious Indian style green peas one pot breakfast. 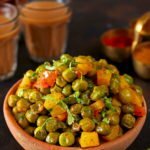 Learn how to make green peas ghugni in a few simple steps. Heat a heavy bottom skillet or pan over high flame. Add all the ingredients and mix nicely. Reduce the heat to low. Cover the pan with a tight-fitting lid. Cook ghugni until peas and potatoes are tender. Taste and adjust the seasoning accordingly. Season with black pepper, lemon juice, and fresh coriander leaves. Serve Matar Ki Ghugni warm with a cup of tea. Delicious, super easy to make. thank you for sharing the recipe..